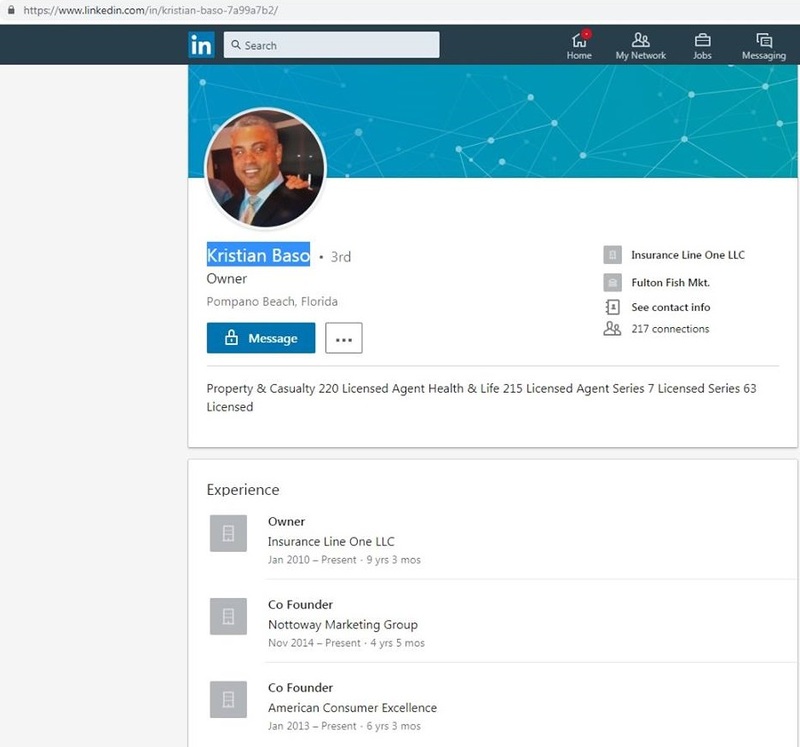 Robocall insurance owner is Pres. Trump & Florida Governor’s Friend ? Can you believe it? A Robocall operator is Pres. 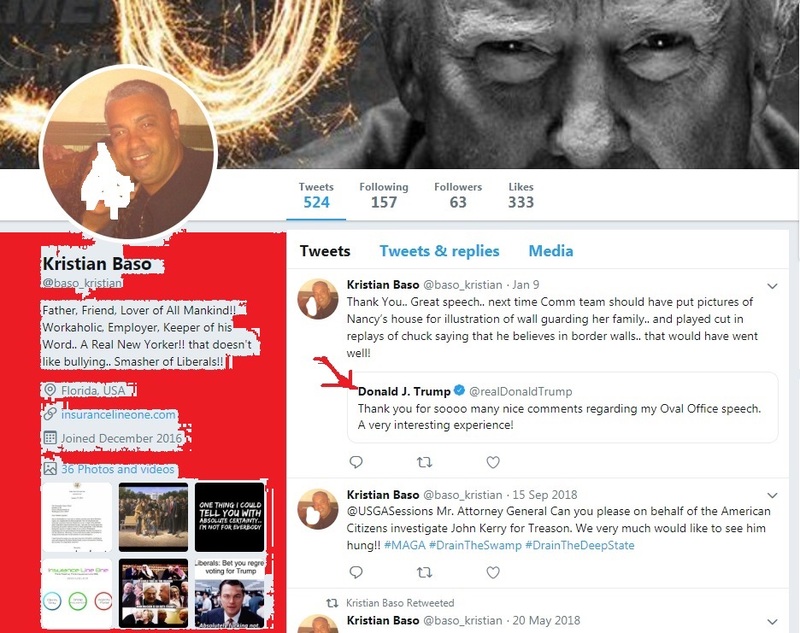 Trump’s friend, at least on Twitter. 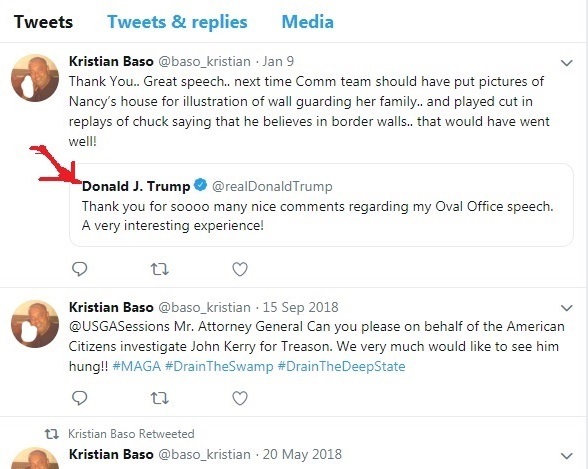 On the above, you can see President Trump’s response to Mr. Baso’s comment on Twitter. So, who is this Mr. Baso? According to his profile, his name is Kristian Baso. He is a true New Yorker. 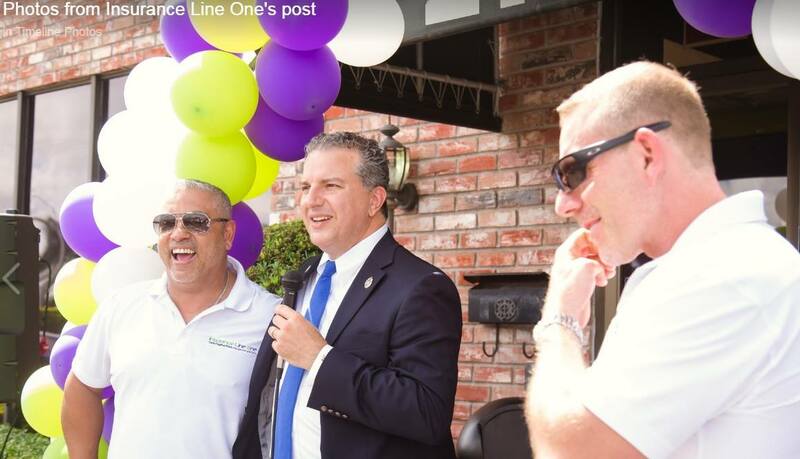 He is also the owner of Health Line One LLC or insurance line one. How dare we said this Mr. Baso, at least a friend or someone that President Trump acknowledge is a Robocall operator? How is he related to Florida Governors? You better keep reading till the end to find out for yourself. A lawsuit: yes, you are looking at one. And you are about to find out the $1500 Federal Penalty for Each Robocall. How many calls have you received? Everything started when one of my clients was scammed by a fraudulent insurance company known as Health Line One Agentra LLC. Through the use of robocalling, they took advantage of my client. She got so excited about being able to save about 50% of her health insurance premium. So she contacted me to cancel her existing group health insurance with a company called Oxford Health. Being a medical doctor, she is a very smart person, hence, she also wants me to help her verify the validity of the plan. The company she got her new insurance from is Agentra. Click below to read more about how my writing this article got us involved in this 750 billion lawsuit. CLICK HERE TO SEE THE ARTICLE THAT GOT THEM TO SUE US!!! My hunch feeling with the insurance initially was, I wanted to be a broker for this company. Imagine, it was so easy to sell, (Aetna NYC Community Plan) when it was $399/single. If there is, according to Dr. M, a PPO plan, (click to learn about what is PPO vs HMO article) with Nationwide network, I would be very thrill to be introducing them to my client. Hence, I started Googling about this Agentra company. If anyone has ever read the About Us section, you may know that my first job was a Web developer, specifically, ASP developer on Microsoft platform. Hence, Googling about a certain product or information is still relatively easy for me. I also not sure if you anything about the Google Push Notification? Hence, a simple Google search of Agentra, will somehow trigger a message to Agentra agent. Next was a robocall/cold call from Agentra. 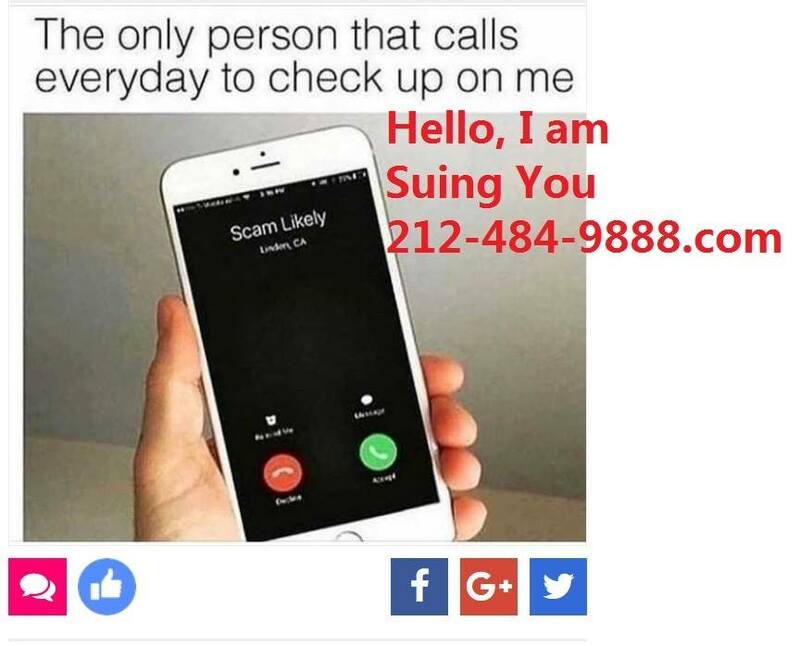 The cold initiated with one of those Robocalls, I specifically pressed 1 or something to show interest in accepting the call, then I was transferred to a male agent who claimed to be licensed in NY. What the male NY agent from Agentra told me was, to the best of my recollection, as if I have strike the lottery jackpot. Hence, I am very interested in learning about this plan, so I asked him for the SBC. The NY agent immediately hung up the call on me. What is up with this SBC. SBC stands for the Summary of Benefits and Coverage. The act of hanging up on me, arouse my suspicions with this company. The scam is taking advantage of President Trump proposed short term plan, that replace President Obama ACA insurance that cover all pre-existing condition and without limit. The limit was a very important thing, to me personally, (again, I have to shamelessly sell my about me page), if I had not cross Michigan state line, the limit would have definitely bankrupt my family. With that little history with me, I love insurance, and I hate people that take advantage of other people by scamming them with Insurance Scams. This is a life and death issue, this is something that will destroy the entire family future. Despite being hung up by the Agentra agent, I still continuously received so many calls from them, yes Robocall, just found out that, it only cost as low as 10 calls per penny. If you had read about the original article, you will realize, the original article has only a few lines of content related to Health Line One. Being the person that hates fake insurance, I added a few lines about them in the original article of Agentra. Next thing I know, Agentra website is taken down for maintenance. Agentra website was put offline for maintenance earlier, and I didn’t expect to be sue by them or Health Line One, hence, I didn’t have too much information of them anymore. 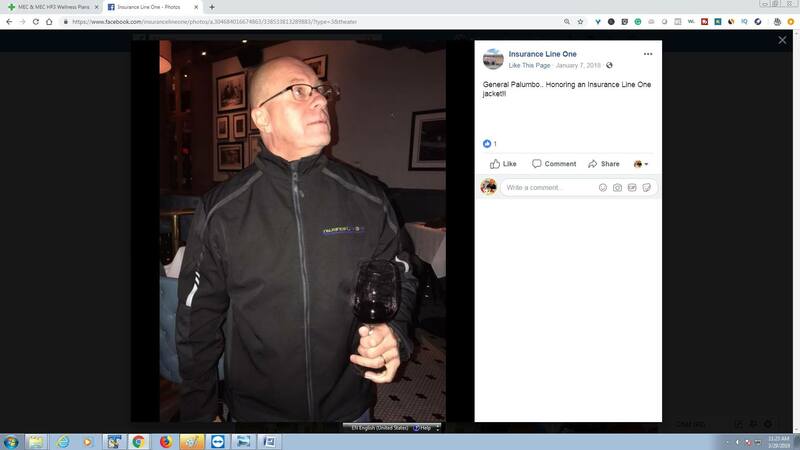 The above link to their Facebook page where I got a lot of information from, including their relationship with Health Line One, and possibly many other company and many co-relations with many possible “fake insurance seller” or “selling fake insurance broker” out there. Just search for Agentra and you will see. The clarification is needed, and I tie Agentra to Health Line One or insurance line one with Agentra Facebook public Facebook pictures. That Facebook page, as I mentioned earlier, is no longer active. Now, I am being sue by Health Line One. Given the previous experience of how easily you can take down a website or Facebook page, I actually deferred the opportunity to seek legal counsel, to defend myself, but to gather all the public information online about Health Line One. Mr. Baso Also Related to Mr. Madoff. Next, I was fearing for my life. 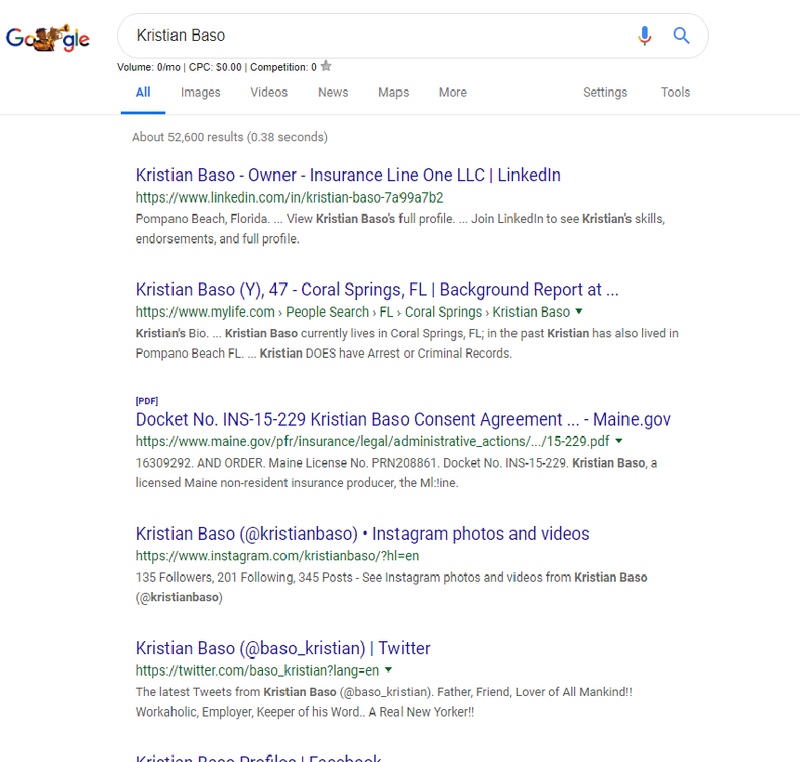 Another quick Google with “Kristian Baso” will reveal the many scary details. Google it for yourself. At this point, I am fearing for my life and my family safety. being taken off line for good. Besides the Governor of Florida, there is also a Military General. 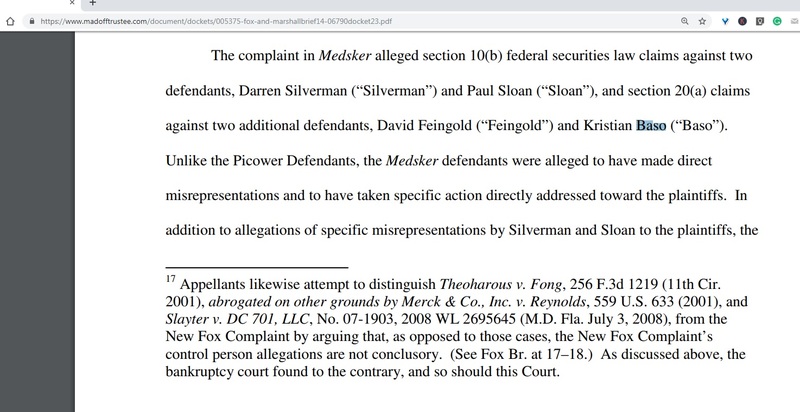 I am not sure why if that is the reason that i still cannot get a lawyer with a Florida license to defend me at this time. I had went out and installed the cloud base surveillance camera, so if you are seeing this, leave my family and myself alone. Our primary business phone number has been hijacked, (click here to read about phone masking). Our primary business phone number, which is also our website name, https://2124849888.com/, is not something that we can change. Imagine if McDonald has to change their name to Burger’s Queen. No US citizen should be force to do that by exercising their First Amendment rights. At this point, every time I try to find a lawyer to represent me and they find out about the relation of Mr. Baso and so many powerful government officials, it is difficult for them to have the guts to take on my case. At this point, in my opinion, I seriously think that my best way of surviving, is to get people’s attention to this matter. Before I can fight Robocall for you, share this article so I can survive. Please share this post. if you hate me for some reason, for the sake of Bella. Did you know that according to Mr. Steve Lehto, there is a $1,500 penalty for each robocall? SHARE this article!!! This is your chance to fight back!